1) Each Peach Pear Plum By Allan and Janet Ahlberg- A perfect introduction, for little ones, to the classic fairy tale characters. On each page you have to spy the fairy tale favorites as they intermingle eventually all coming together for pie. 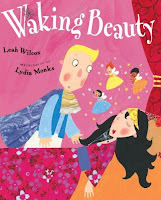 2) Waking Beauty By Leah Wilcox- A twist on the classic Sleeping Beauty in which the prince trys to wake the sleeping princess up in every other way possible in an attempt to not actually have to kiss her! This one makes me laugh out loud every time we read it. 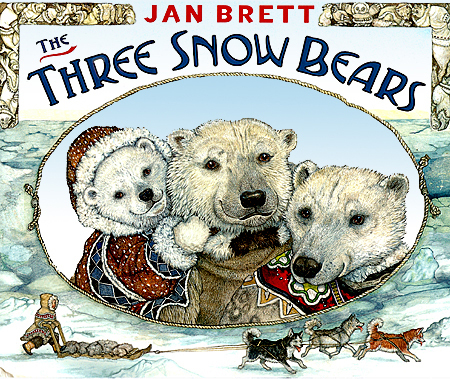 3) The Three Snow Bears By Jan Brett- A slight location change for the classic "Golidlocks and The Three Bears" brings the story to the far north where a girl named Aloo-ki happens upon the igloo of three polar bears. I always love Jan Brett's illustrations, filled with so much detail to look at. 4) The True Story of the 3 Little Pigs By Jon Scieszka- The fairy tale of "The Three Little Pigs" told from the wolfs perspective, he claims it was all a misunderstanding. Another one for a good laugh! 5) The Princesses Have a Ball By Teresa Bateman- In the classic story of "The 12 Dancing Princesses" the girls mysteriously wear out their shoes every night by dancing. In this version the princesses wear out their shoes playing basketball. The Bee really likes this one. 6) There's a Wolf at the Door By Zoe Alley- 5 wolf related tales in a graphic novel style, oversized book. Although this one is probably most enjoyed by kids in the 6-9 range the Bee definitely liked it and Alley's other book There's a Princess in the Palace was a big hit too!